As we begin the new year, the brutal Midwestern winds and the lake effect snow machine are both working hard to bring us record low temperatures and extreme weather conditions. Many local schools/businesses are closed again today and I am anticipating a difficult commute to work this morning. As the sun comes up and the traffic begins to build, I will be keeping an eye on the posted travel alerts as I may, very well choose to work from home today. While everyone is still tucked warm in their beds, I’ve decided to get an early start and begin baking a few items as we may be hunkered down indoors for a while. The warmth of the oven will certainly help to heat the chilly kitchen. It seems the heater is working double time to try to keep up with the thermostat. 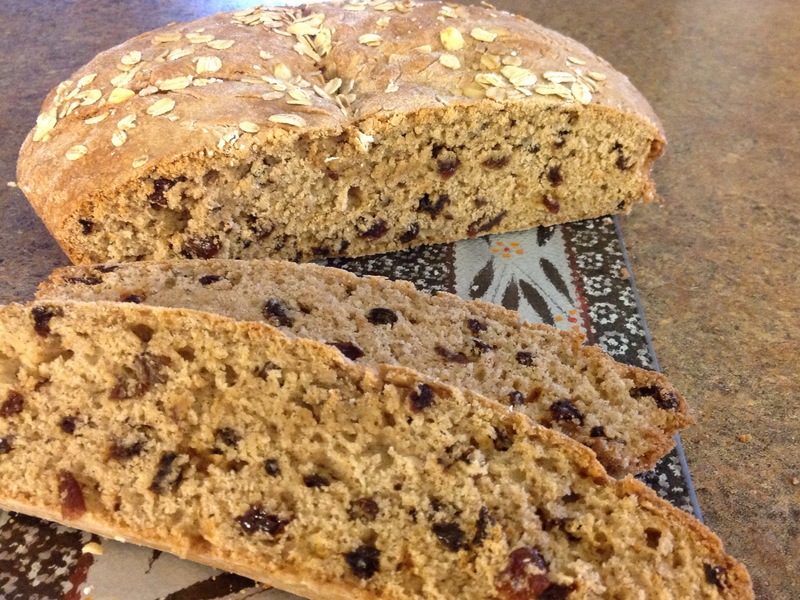 Recently, I saw a post for Irish Soda Bread that caught my eye. You can find it posted as Irish Raisin Bread at “If I Only Had A Time Machine”. The recipe included many ingredients that I don’t typically add to my mother’s traditional recipe. With a few variations, I made the loaf for my family on Monday night. Boy, everyone certainly enjoyed the new flavors and textures of this recipe. Last night, I sliced up the last of the bread and vowed that I would soon make a few more loaves. 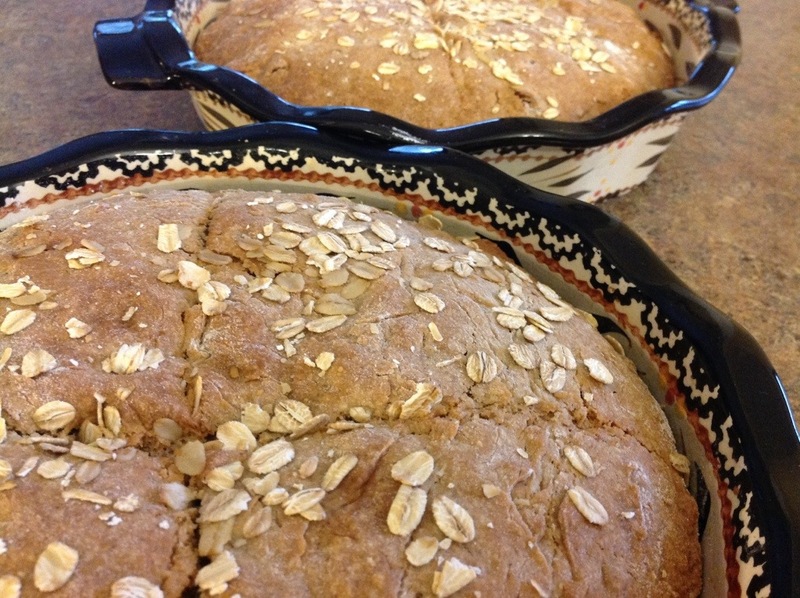 So, along with a pan of baked oatmeal, I think I’ll be making another batch of bread this morning. I’m sure the warmth of the oven and the smell of freshly baking bread with help to shake of the winter blues as we have many more months of this crazy weather ahead of us. (I just looked it up… we have 70 days and twelve hours left until the arrival of Spring.) Bundle up and stay warm! Preheat oven to 350 degrees. Grease and flour two round cake or pie pans. Combine first seven (dry) ingredients in a large bowl. Mix thoroughly. Cut in butter or margarine until the texture resembles course crumbs. Add raisins. In a separate bowl mix remaining (wet) ingredients. Mix wet ingredients into the dry ingredients forming a soft dough. Place dough onto a floured surface and knead well. Form into round cakes, place in prepared pans. Slice a light cross down the center of the loaves and sprinkle with oats. Bake for 40-50 minutes. When I was a young girl, my family used to travel to Ireland every year for our summer holiday. My father worked for TWA (Trans World Airlines) and we had a great travel benefit that we regularly used. My mother was born and raised in County Clare and my father from County Kerry. Our wonderful trips into Milltown Malbay, Spanish Point or visiting Ballybunion always bring the fondest of memories. Oh, the stories I could tell of the laughs we shared as a family. We would load our tiny rental car up with 8 kids, two adults, and lots of luggage. Relatives would meet us at Shannon Airport and take on a portion of our luggage as we headed toward Milltown. One of my most vivid memories relates to my grandmother, my mother’s mom. She would get up early to milk the cows and feed the chickens. Then, she would come indoors and bake the most amazing bread. Now, this bread was like nothing I had ever tasted before. Sure, my mom and all the aunts baked their own version of Irish Soda Bread or scones but this was different. 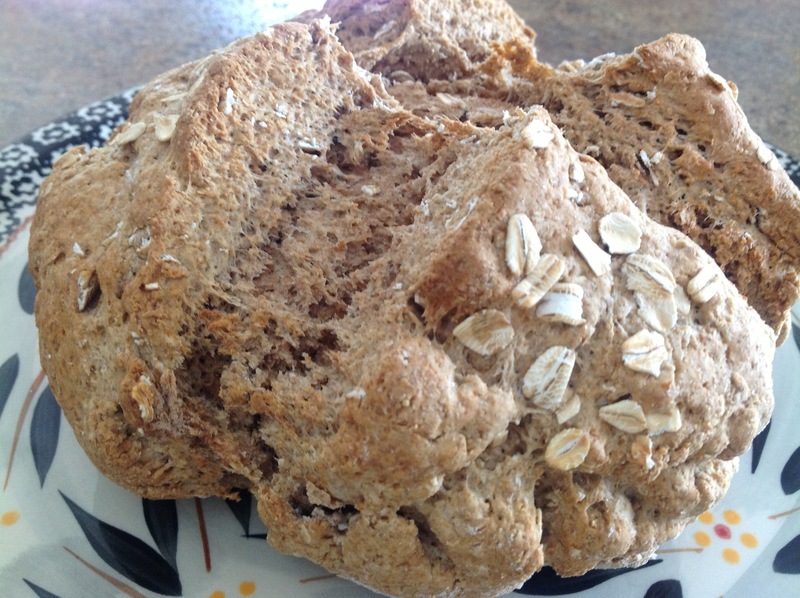 The bread was a hearty, textured loaf made with whole wheat flour. She would mix it up by hand, in a huge stoneware bowl (maybe a Green’s or Mason Cash Brand). I have tried on several occasions to replicate the recipe and this is as close as I have come to the original. 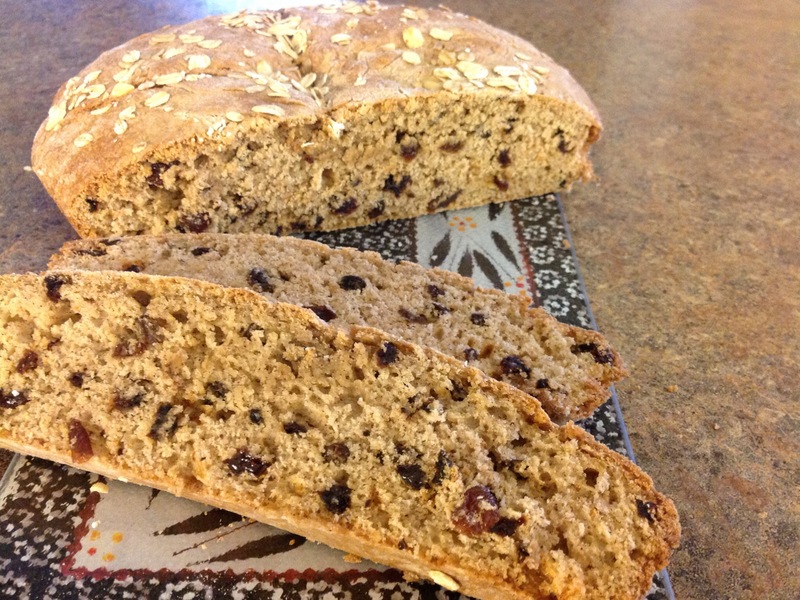 If any of you would like to share your recipe for your version of Irish Brown Bread, I would so appreciate it! 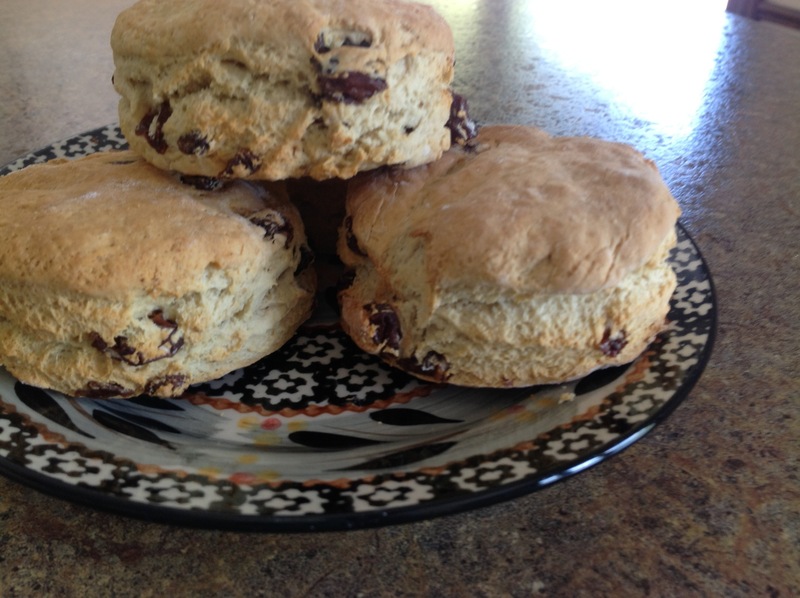 If you’re a fan of Irish Soda Bread, check out my family recipe for Mary’s Irish Scones here. Preheat oven to 375 degrees. In a bowl, mix flour, sugar, baking powder, baking soda, and salt. With a pastry blender or 2 knives, cut in butter until mixture forms fine crumbs. Stir in whole-wheat flour and oats. Add buttermilk; stir mixture gently. Turn dough onto a lightly floured board and knead 5-10 times to make a ball. Set on a baking sheet. Pat into a 7-inch circle. With a floured knife, cut a large X on top of loaf. Bake until well browned, about 30-35 minutes. Cool on a wire rack.